So, moral of this story - co-workers will fall in love with you all over again if you take them to BBB for the very first time! Bellaire Broiler Burger Virgins Betsy and Casey Before Their Very First Bites! It's been great how so many family members and friends have embraced my blog, as well as my burger obsession. 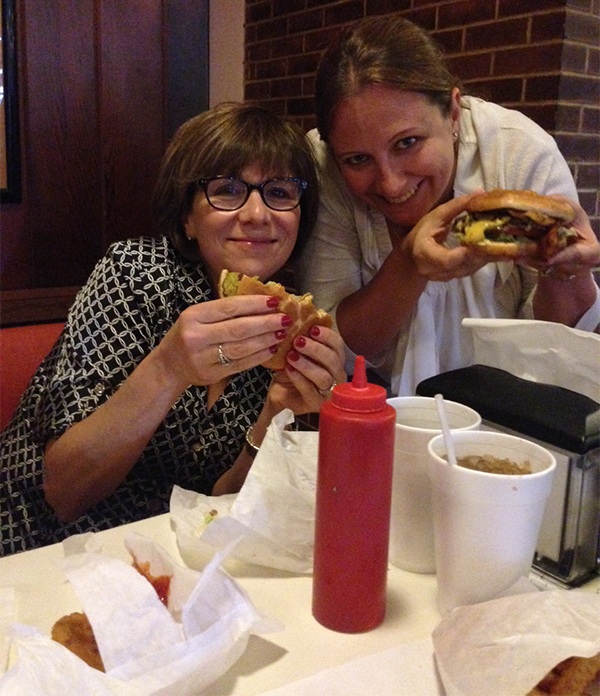 Saturday's burger adventure came as a suggestion from "Susan". "Why don't we try The Burger Barn in Manvel, Texas? ", she asked. We had passed by this place several times en route to Galveston. I went directly to their website, and was in awe of the vast selection of (25) burgers they offered. So, off we went! Arriving at The Burger Barn around 3:30pm on a Saturday, Susan and I were both immediately impressed with the crowd for that time of day. "Was this a good sign?" we both wondered. We went up to order our burgers, and I had my usual - Bacon Cheeseburger, with onions, lettuce, jalapeno, light mayo, and a fried egg. When the burger arrived, it was quite tall. Cutting it in half with the flimsy plastic knife they offered was a bit of a challenge, but once I took off a layer of (too much) iceberg lettuce, I was able to take my first bite. While tasty, the meat was a little overdone, and the burger was really nothing exceptional. The bun was buttered and grilled nicely, and the fried egg was not too runny - adding a nice flavor to the burger. Without the fried egg, I'm sorry to say, the burger would be nothing more than just average. The prices at The Burger Barn are as cheap as it gets - $4.89 for a burger! So, if you're out for a drive along Highway 6 in Manvel, Texas, and hungry, I'd stop by for a cheap burger and a beer. Otherwise, go some place closer to home. Anticipating my first bite while co-erced into posing with the menu.